But not so much for us. We’re building a Garden for Wildlife Habitat and already have a variety of wild birds, possums, foxes, lizards, skinks and frogs that live here. Some birds are seasonal. We get the occasional wombat passing through – not that we’ve seen it, just the evidence that it has been here. Also wallabies and kangaroos visit and while that sounds lovely, it does mean that many of our new plants get eaten so it’s a battle to get them to grow and survive long enough to grow big enough that it won’t matter if they get nibbled on. Hope you got that! Some seasonal visitors are ducks – currently we have Australian Wood Ducks and Black Pacific Ducks who make regular visits. Although we haven’t seen the wood ducks for a few days now so suspect they’re nesting in a tree nearby. We’ll see them again once their young are old enough to jump out of their tree nest and come and enjoy our billabong. I mentioned ‘Danger in the Garden’. Occasionally we hear the squeal of an animal late at night and know that it’s been caught by an Owl or another raptor in the dead of night. Seems cruel and sad but that is how nature is. And this is the danger I’m talking of today. Our garden is a hunting ground for different birds and animals and, as our garden grows and develops, I’m sure that this will increase. The cycle of life. Yesterday, I was sitting in my office at my computer and noticed movement out the corner of my eye through the window nearby. When I looked I saw a kookaburra on the garden path and it was swinging its head from side to side. I realised it was thrashing something on the ground it had caught. I grabbed my camera with the long lens to zoom in and get a closer look. It was longer and bigger than a worm or skink. And then I realised it was a frog. I felt sorry for the poor frog but what could I do? It is nature doing what it does. So I stood there at the window and captured what I was witnessing – the images aren’t as sharp as I would like but they still give you a good idea of what I saw. 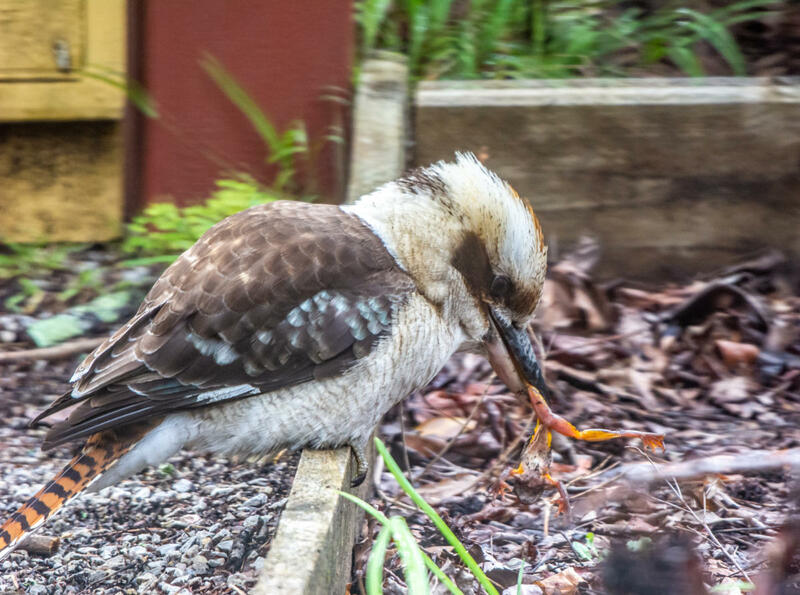 Sad as I was for the frog, I was also thrilled that I got to witness this first hand – a kookaburra with its prey. A keen gardener from a young age, thanks to my grandmother, I've grown just as passionate about gardening photography too. This site allows me to combine both.